It turns out that you can't get enough of a good thing. U2 may be in the midst of their third major world tour in four years, yet the awe-inspiring spectacle of their Experience + Innocence Tour at the 02 Arena in London on Wednesday night left everyone gasping for more. The invention and genius of their long-time manager Paul McGuinness ensured that U2 gigs have long since been an event as much musical showcases, yet seeing Bono, Edge, Adam Clayton and Larry Mullen Jr doing their thing up close and personal under the roof of an indoor arena makes the feast all the more delicious. The critics have always gone out of their way to find fault with a U2 phenomenon that has extended over four glorious decades, yet none of the fans flocking to watch the band, who Bono reminded us were 'just Irish four boys from the north side of Dublin', went looking for faults. This congregation had gathered for another sermon from their messiahs. They were not to be disappointed. Last year's Joshua Tree Tour paid tribute to the U2's most iconic album as it celebrated its 30th anniversary and with that show still fresh in the minds of fans who were back for a more little over a year later, the decision to drop tracks like With Or Without You and Where The Streets Have No Name opens up space for more of the band's extensive back catalogue to get an airing on this tour. "We want to make some of our new songs famous," confirmed Adam earlier this month and they certainly rammed home that point with a breathless set in London that started with The Blackout and Lights of Home from their 2017 Songs Of Experience album before the pace picked up with a cascade of classic U2 songs that were illuminated by a electrical storm that mesmerised a bouncing crowd. 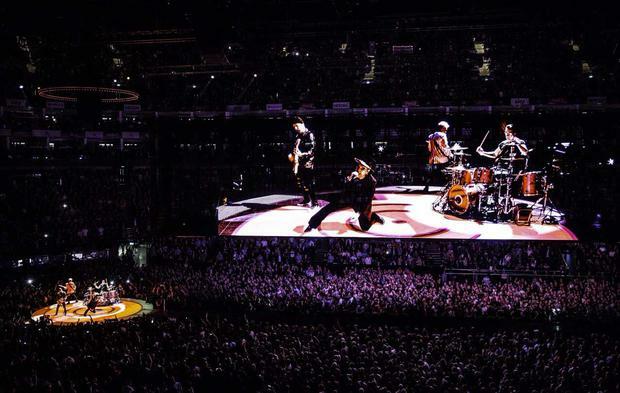 The huge screen hanging from the ceiling of the 02 Arena was an entertainment force on its own, with its ability to project crystal clear images, tilt when required, and hold all four members of U2 as they crash out their hits allowing it to become a fifth member of this iconic band. Bono and his crew were encased in the hanging screen for Wild Horses, with the set performed on the smaller 'E Stage' allowing fans at the other end of the arena to get up close and personal as Elevation, Vertigo and Even Better Than the Real Thing set pulses racing. With Oasis frontman Noel Gallagher among those looking on, the atmosphere reached a crescendo as the band were spread to four corners of the arena and projected in unison onto the screen for the anthem Pride. Bono's eagerness to thank the British audience for 'giving us an amazing life' drew cheers and while some critics suggested U2's frontman spent a little too much time talking politics on the Joshua Tree Tour, there can be no such complaints this time as these two-and-a-half hours were crammed with gems to cherish. However, Bono did pause in front of a huge European Union flag in what amounted to an appeal to his audience to walk away from the looming threat of Brexit to make this declaration: "We've been touring all across Europe and all we hear is that the people love the UK and no-one wants you to leave. This is more than just a gold star falling off a blue flag. Without you, we are less. Without you, the English, the Scottish, the Welsh, the Northern Irish, we are less." With the politics box ticked, it was on to the finale, with no U2 show complete without the echoes of One tugging at the emotional heartstrings. When it's all over, you cannot help but crave just one more blast. Conclusive proof that U2 remain even better than the real thing. U2 will be at Belfast's SSE Arena on October 27 and 28, before performing sell-out shows at the 3 Arena in Dublin on November 5, 6, 9 and 10. By Julia Hunt, Press Association Entertainment Correspondent Iman has paid tribute to her late husband David Bowie on what would have been their 27th wedding anniversary. By Sherna Noah, Press Association Senior Entertainment Correspondent Gaining audiences for BBC Sounds will take “determination and focus”, the broadcaster has said, as it announced plans to advertise for a boss for the audio app.